Chef “Vary” Varinia Cappelletti was born in Milan, Italy. She first began studying archeology and received her masters from the University of Siena. It was in 2000 that she started turning her passions towards the culinary arts. She used her background in Italian history to recreate traditional Italian recipes using only fresh ingredients. Since then she has been hard at work creating unique dishes with authentic Italian flavors for her guests. Through her work operating the B&B with Edoardo, Chef Vary started offering guests a special 5 course meal during their stay. 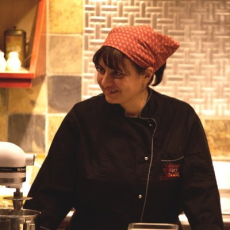 She prepares the meals with local ingredients, original recipes and genuine Italian flare! Since offering the 5 course meals at their B&B, they have received many inquiries to travel to the U.S. and bring their culinary creations! So in 2009, they began traveling the states. They began their tour with a private dinner in Florida and cooking demonstrations at a high-end appliance showroom in Michigan. This then hatched their growing U.S. Tour of personal-chef appearances, private dinners, cooking courses and cooking demonstrations.“White Lily LLC” was launched in 2010 by Varinia and Edoardo. From 2010 through 2012, they added new cooking demonstrations and private events around United States. This provides true Italian tastes no matter where they travel in the U.S.Chef Vary’s enthusiasm and passion for cooking is demonstrated in her attention to detail, innovative Italian cuisine and culinary masterpieces! In march 2012 Varinia and Edoardo pubblished our First Cook Book. Tiramisù Amore mio White Lily LLC offers several service like: imports of gourmet and “Italian Slow food” products, Product Launches/Demonstrations, Analysis of food competition in the U.S.